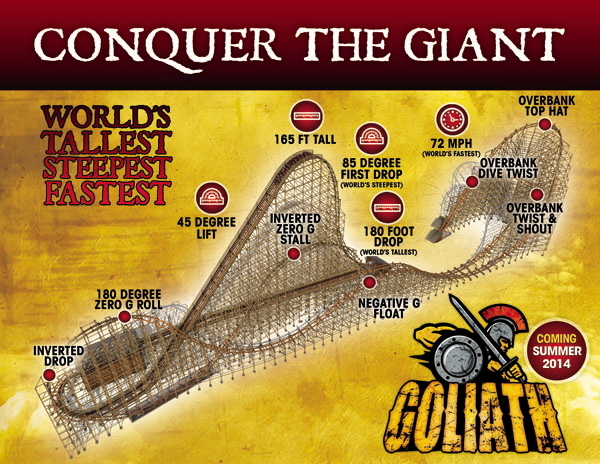 Six Flags Great America Alters New"Goliath" Coaster. Well folks, this new came as a surprise to most big coaster fans who've been watching the construction of Goliath closely. Six Flags Great America and Rocky Mountain Construction may have had this plan all along but the facts and reasons behind this change are still unknown at this time. The main changes to the ride involve moving the Zero-G roll which has moved from the original renderings, it's not located under the lift hill and seems to be added support. When comparing the new rendered images to the original fact sheet on the coaster you can spot the differences. SFGAM NATION has some really great construction photos of the ride and it's current progress. 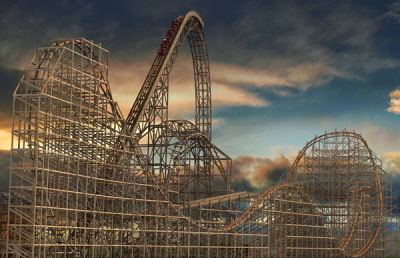 Their stating that this new rendering has been the plan and are the finalized plans for the ride. The lift hill is expected to go vertical in the new month or two. We'll keep you posted with any news!